A Sora forages for food in an Erwin wetland along the linear walking trail. The hummingbirds, as I reported last week, are back. I’m hearing from readers across the region about the arrival of these tiny flying gems. • Nata Jackson, who lives in Greene County, sent me an email to let me know that she saw her first Ruby-throated Hummingbird of spring on April 14. She had put up her feeders at about 2 p.m. Five hours later, she walked by the window and saw a male hummingbird at one of the feeders. • Patricia Faye Wagers, who lives in Kingsport, saw her first hummingbird — a male — of spring on April 16, as well. However, after I saw my first hummingbird of spring on Friday, April 11, I haven’t seen one since. Maybe the cold snap persuaded them to keep journeying north, or maybe they turned back south for a few days. I’m hopeful a few hummingbirds, as they usually do, will take up residence in the yard for the rest of the summer. I spent the morning of Friday, April 11, birding with Margaret Roy along the linear walking trail in Erwin. She wanted to get an introduction to a guided birding experience in advance of a planned fall birding tour that we plan to offer through Mountain Inn & Suites of Erwin, where Margaret is the general manager. A Solitary Sandpiper seeks food at the water’s edge in a wetland at Erwin Fishery Park. We had a fantastic morning, highlighted by a lengthy observation of a Sora from the wetland boardwalk near the industrial park. The Sora is a member of the rail family, which includes such species as Clapper Rail, Virginia Rail, King Rail, Yellow Rail and Black Rail. 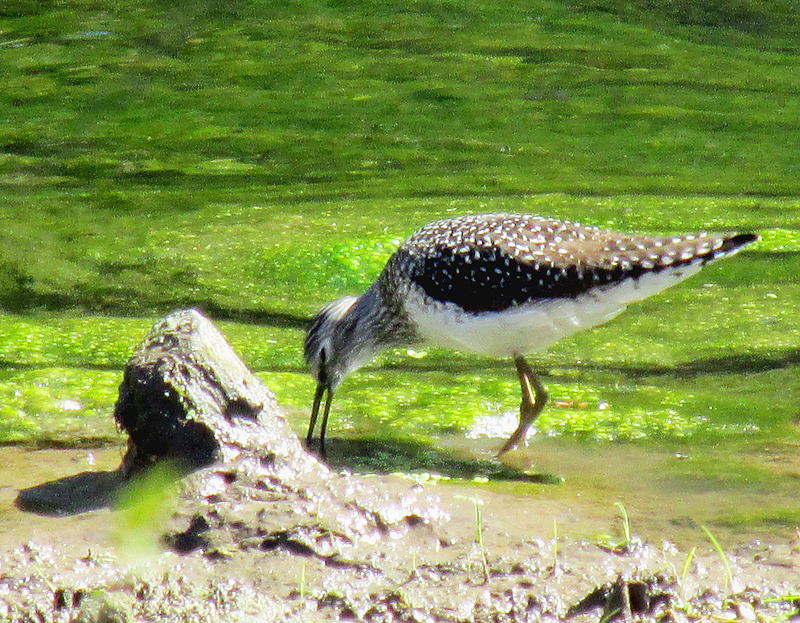 We also saw a Greater Yellowlegs, Solitary Sandpiper, Yellow Warbler, Yellow-rumped Warbler, American Coots, Pied-billed Grebes, Brown Thrasher, Song Sparrows, Mallards, Canada Geese, Blue-gray Gnatcatchers, Northern Rough-winged Swallows, American Robins, Downy Woodpeckers and a pair of Red-bellied Woodpeckers excavating a nesting cavity in a sycamore tree. Several of the birds – Greater Yellowlegs, Solitary Sandpiper and Yellow Warbler – represented my first spring sightings. Our observation of the Sora, however, provided the most excitement of the morning. This is a bird that is only infrequently encountered, especially in this region. Rails, the Sora included, are shy, elusive and designed with the primary purpose of avoiding notice. Worldwide, there are more than 130 species of rails. Many members of the family are called rails or crakes, but the family Rallidae also includes coots, moorhens, swamp-hens and gallinules. Many species of rails have evolved into flightless species of birds. All the species encountered in North America, however, are capable of flight and long-distance migrations. Many of the world’s flightless rails have gone extinct in the past few centuries. Many are considered endangered, including Lord Howe Woodhen, the Takahē and the Guam Rail. The Sora is a small bird that’s not much bigger than an American Robin. 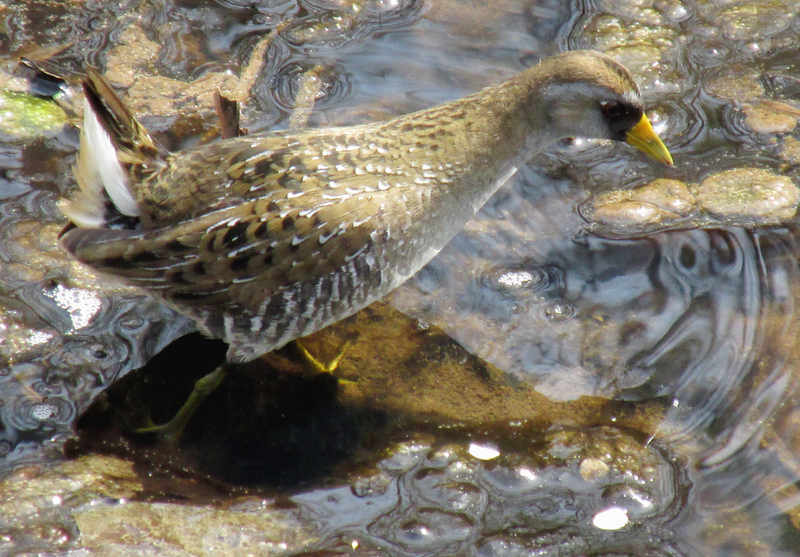 While many rails are plain-looking birds, the Sora is fairly distinctive in its appearance with a slaty gray body, a short, yellow bill, long legs and a short tail, often held upright showing white underneath. Soras also have a black face and throat. As we watched the Sora foraging among cattails and other vegetation beneath the boardwalk spanning the wetland along the linear trail, the bird moved deliberately and alertly. As we watched, the Sora flipped over leaves and other debris with its bill, often snatching small prey organisms. This bird enjoys a varied diet that can include seeds, insects, crustaceans and snails. A Sora finds a meal in a wetland spanned by a boardwalk along the Erwin linear walking trail. At the end of our observation, the Sora turned and simply walked into the cattails, fading from view almost instantly. The sudden disappearance of a bird so capable of navigating effortlessly between reeds and cattails reminded me of the phrase, “as thin as a rail,” which seems particularly apt for the Sora. This normally secretive bird makes its home in freshwater marshes throughout Canada and the central United States. The Sora is the most common and widely distributed rail in North America. The Sora also ranges into Central and South America. Like many rails, it is quite vocal with a distinctive descending whinny call can be easily heard from marsh vegetation, but actually seeing a Sora is often a fluke of being in the right place at the right time. The sighting recently in Erwin is the best I’ve ever had of a Sora in Northeast Tennessee. Another memorable observation of a Sora took place years ago on Fripp Island, S.C., when my mother and I watched a bird wading at the edge of a waterway on one of the island’s many golf courses. 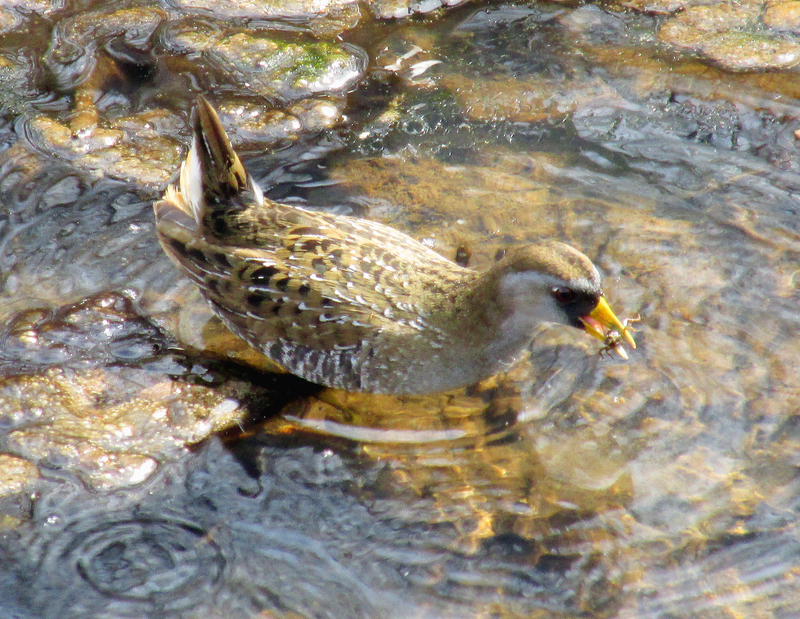 In addition, during a field trip many years ago with members of the Lee and Lois Herndon Chapter of Tennessee Ornithological Society, I saw a Sora wading in a flooded ditch in a pasture at Austin Springs on Boone Lake. Many of my encounters with this species have been represented only by hearing them call from wetlands in Bowmantown and Shady Valley. The book, “The Birds of Northeast Tennessee” by Rick Knight, classifies the Sora as a transient bird in the region that is occasional to uncommon in spring and fall. The Sora is an elusive member of the rail family that is more often heard than seen. 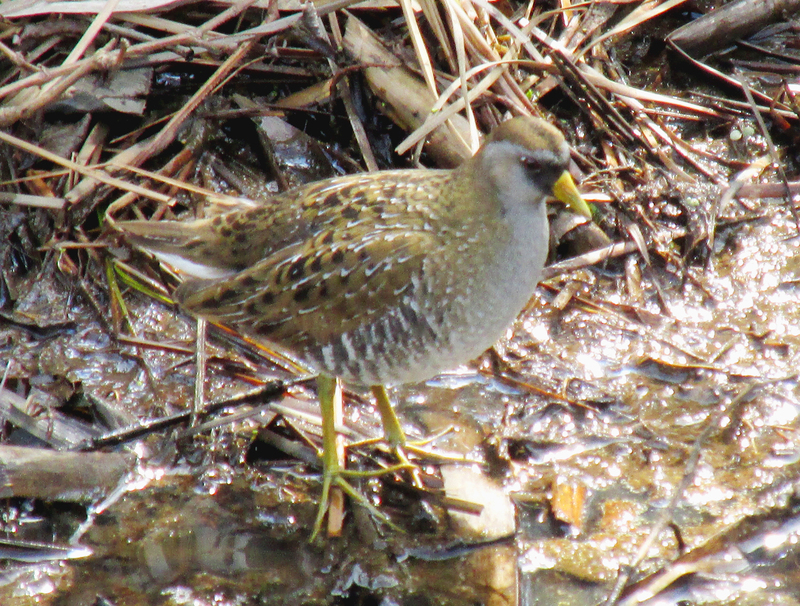 Two days after Margaret and I saw the Sora in Erwin, Elizabethton residents Cathy Myers and Tom McNeil found a Sora and a Common Yellowthroat at Henderson Marsh, which is located in on Crestview Road in Bowmantown in Washington County. Of course, Soras are only one of many species migrating through the region. Vireos, warblers, shorebirds and flycatchers are among those arriving with every passing day. Many birds are already nesting. A female Northern Cardinal is sitting on a nest in a yew tree at my home on Simerly Creek Road in Hampton. I also visited the Great Blue Heron nesting colony along Blevins Road on the Watauga River in Elizabethton. I found several more nests have been added since my last visit a couple of weeks ago. I would love to hear from readers. You can also reach me on Facebook or send email to ahoodedwarbler@aol.com. Please share a link to the column with others who might be interested in the topic of birds and birding in Northeast Tennessee. This entry was posted in Birding, Birds and tagged Elizabethton Star, Erwin Record, Great Blue Heron, Rails, Rallidae, Solitary Sandpiper, Sora on April 20, 2014 by Bryan Stevens.